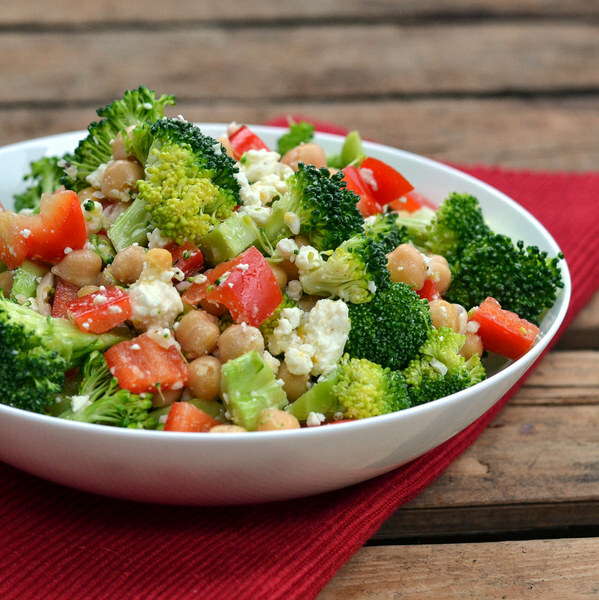 ← Broccoli, Bell Pepper & Chickpea Salad with Feta & Zesty Lemon Dressing. Fill a medium saucepan about halfway with water, cover, and bring to a boil. Wash broccoli, separate into bite-sized florets, and cut thick stems into smaller pieces. Once water is boiling, add broccoli to saucepan and cook until bright green and tender-crisp, 1-2 minutes. Drain and run under cold water. Set aside to drain excess water. Peel and mince garlic. Wash lemon and grate 1 tsp of zest. In a large bowl, prepare dressing by whisking together garlic, lemon zest and juice, oil, Dijon, honey, salt, and pepper. Rinse and drain chickpeas. Place on paper towels and pat dry. Add to bowl with dressing and toss to coat. Wash and dry bell pepper and parsley. Seed and medium dice the pepper. Shave parsley leaves off the stems; discard the stems and mince the leaves. Add to bowl. Add broccoli and feta to bowl. Toss salad. To serve, place salad on a plate or in a bowl. Enjoy!